Burton as Brevet de Pointe, by Albert Letchford. The original is held at the Orleans House Gallery in Richmond, which is well worth visiting. 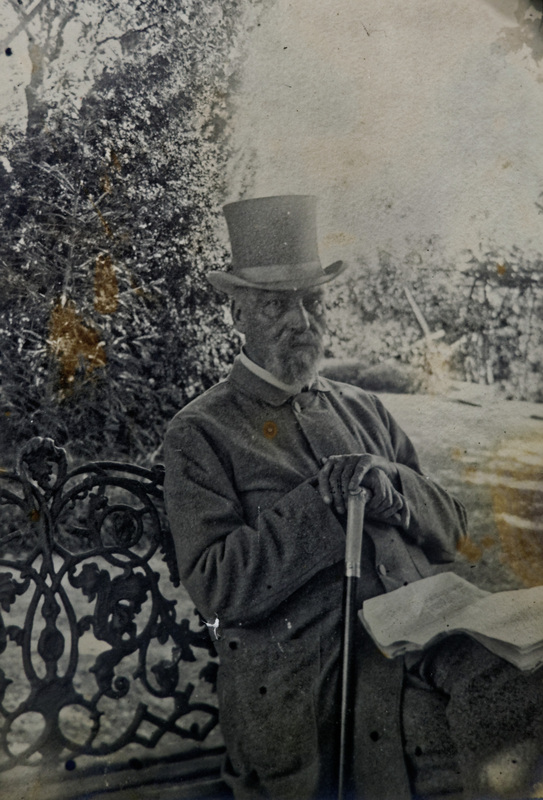 In the garden at Trieste circa 1890, taken by F. Grenfell Baker. Pay, pack and follow: the Burtoniana blog is now active. Commenters can post their valuable thoughts there. Definitely beta! Trinity College (Cambridge) has unearthed a unique copy of First Footsteps in East Africa with a complete Appendix IV, in the Crewe Collection (images are provided). The exceptionally rare second leaf (2 pages) is present in handwritten form! This is a presentation copy from Burton to Monckton Milnes (later Lord Houghton). The complete Appendix IV has never been translated. A partial translation, based on the first leaf, can be found in Gordon Waterfield's interesting reissue (with fresh material) of First Footsteps, published by Routledge and Kegan Paul in 1966 . Improved facsimile of Burton's translation of Basile's Pentamerone (thanks to Jason Clapham). New Light on Burton's Karachi Brothel Report. Now published here: The Book of Burtoniana: Letters and Memoirs of Sir Richard Burton edited by Gavan Tredoux, in 4 volumes. Downloadable freely in HTML, PDF, Kindle/MOBI and ePub formats for educational and scholarly purposes. Announcing The Book of Burtoniana, edited by Gavan Tredoux, in 4 volumes. Added Notes of a Reconnaissance of the Anti-Libanus Journal of the Royal Geographical Society. Vol. XLII (1872), pp. 408-25. Map. Added Memorandum by Consul Captain Burton, on the Baghdad Caravan. Accounts and Papers Vol. XXIX for 1871. Added PDF facsimile of Review of Stanley Lane-Poole, The Life of Stratford Canning, Viscount Stratford de Redcliffe. [Part 2] Academy Vol. XXXIV (1888), pp. 379-80. Added PDF facsimile of 'Reprints of the Arabian Nights' Academy	Vol. XXXIV (1888), pp. 103-4. Added a facsimile of the pamphlet The Ogham-Runes and El-Mushajjar: a Study(1882). Improved facsimile of Zanzibar (1872). Added PDF facsimile of the Ananga Ranga. Improved facsimile of Unexplored Syria (1872). Added more photos and details of the Burton Tomb in Mortlake, London. Added the exceptionally rare Blue Book from 1872 The Case of Captain Burton. Added a better facsimile of the two-volume Wanderings in West Africa. Added pictures of the Burton Conference held on October 19-20, 2015, in Trieste. Added pictures of Burton's tomb, including decent views of the interior of the tomb from the rear. Added more images of Burton ephemera and items from Trieste, including views of the present-day interior of the building which was once Burton's private residence there. Added the first volume of Hitchman's biography of Burton, Richard F. Burton K. C. M. G.: His Early, Private and Public Life with an Account of his Travels and Explorations, so that both volumes are now available here. The Burtons initially cooperated with Hitchman, and large swathes of Isabel Burton's Life follow it closely, e.g. the Crimean episodes. Added many missing articles and letters from the Athenaeum. New electronic edition of the fabulously rare Lord Beaconsfield: a Sketch (1882). Apparently only 25 copies were printed, now only a handful are known to survive. Review by Kathleen Ladizesky of Godsall's Burton biography The Tangled Web (2008). New page of Burton ephemera, such as coins, cigar labels, cigarette cards and the like (thanks to Mick Walton for the material). New page of Trieste-related Burtoniana, including photos of his old villa there (again, thanks to Mick Walton). Added a facsimile of William Rainy's exceptionally hard (impossible, really) to find attack on Burton: The Censor Censured: the Calumnies of Captain Burton (1865). Jon Godsall's ground-breaking new biography of Burton The Tangled Web (2008) has just been released and delivered to burtoniana.org. Essential reading. Drop everything and get your copy. Posted a facsimile of John Hanning Speke's exceptionally rare pamphlet My Second Expedition to Eastern Intertropical Africa (Cape Town, 1860). There are perhaps 3 or 4 copies of this still in existence worldwide. John Hanning Speke's obituary from the Times, DNB entry and other material. Added a superb facsimile (from the Internet Archive) of A E I : Arabia Egypt India. A Narrative of Travel. (1879) by Isabel Burton [At least some of this work was actually by Richard Burton himself]. Added Burton's first two publications: "Notes Relative to the Population of the Sind; and the Customs, Language, and Literature of the People" (written in 1847) and "Brief Notes Relative to the Division of Time, and Articles of Cultivation in Sind; to Which Are Appended Remarks on the Modes of Intoxication in That Province" (1848). Many previously uncollected articles from the Athenaeum and elsewhere will follow shortly when time permits. Added the pamphlet Thermae of Monfalcone, and the original articles from The Field of 1881, also titled 'Thermae of Monfalcone' (and not 'Curious Cures' contrary to Penzer). Added a new edition of the exceptionally rare pamphlet Three Months at Abbazia (1888), Burton's entertaining grumble about his holiday in Istria. Better facsimile of Goa and the Blue Mountains (thanks to James Gifford) and some of the color plates. 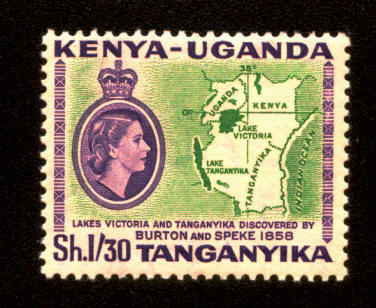 Added an image of the commemorative stamp issued in 1958 to celebrate the centenary of the discovery of Lake Tanganyika by Burton and Speke [thanks to Pushpendra Shah / Nairobi]. Added complete facsimile of Sindh and the Races that Inhabit the Valley of the Indus (1851) [thanks to Pascal for doing the hard work on this]. Added complete facsimile of The Book of the Sword (1884). Added the massive 450-page book-length paper "The Lake Regions of Central Equatorial Africa" (JRGS, 1859), the superior precursor to the later book The Lake Regions of Central Africa (1860). Added two complete facsimiles of The Sentiment of the Sword (1911), a series of articles reprinted from The Field. Added facsimiles of nearly 200 of Burton's journal and magazine pieces. Added the previously missing chapter "Horseflesh" from Volume 1 of Zanzibar: City, Island and Coast (1872). So the complete two volume set, which is very hard to find in the original, is now available here in facsimile. Added images from the suppressed Appendix IV (on female circumcision) of First Footsteps in East Africa. Added the second volume of Os Lusiadas (1880). Hence the entire 6-volume series on Camoens is now available here. Added the second volume of Camoens: the Lyricks, Englished by Richard F. Burton. Complete facsimiles of Isabel Burton's two volume Life of Captain Sir Richard F. Burton, with the cover designs. Volume 2 of Wanderings in West Africa. Complete facsimile, from an original, of the highly collectable A Complete System of Bayonet Exercise. Volume 2 of Ultima Thule. Volume 2 of The Land of Midian Revisited. Added Walter Phelps Dodge's hagiography The Real Sir Richard Burton (1907). The first edition of Bate Richards' A Short Sketch of the Career of Captain Richard F. Burton. A facsimile of the exceptionally rare Stone Talk by "Frank Baker" (Richard Burton). A facsimile of Burton's translation of Il Pentamerone.